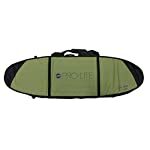 This bag is designed for the traveling surfer taking 3-4 boards. Cut 25″ wide with a 10″ gusset to allow for extra internal volume. 10mm foam protection. Includes one internal divider and one board packer bag, internal seat belt straps, four exterior compression straps and 600 Denier poly on top and bottom. Identification badge on side. Multiple interior storage/fin pockets. Vent to allow air flow to keep boards cool. 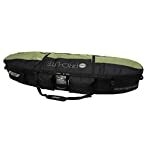 The Finless Coffin Trip Bag Triple/Quad is designed for the traveling surfer taking 3-4 boards. This bag has 10mm foam protection and a ten” gusset to permit much more internal volume. Molded PK #10 non-corrosive main zippers stay the movement smooth for the lifetime of the bag. 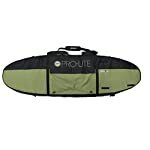 This bag is designed for the traveling surfer taking 3-4 boards. Cut 25″ wide with a ten” gusset to permit for added internal volume. 10mm foam protection. Includes one internal divider and one board packer bag, internal seat belt straps, four exterior compression straps and 600 Denier poly on best and bottom. Identification badge on side. More than one interior storage/fin pockets. Vent to permit air glide to stay boards cool. Exterior side pocket for tie downs/molded rubber handles on ends and side.